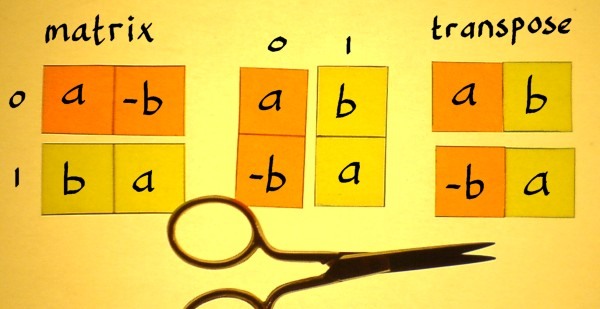 The 'transpose' of a matrix is often referenced, but what does is mean? It sure has an algebraic interpretation but I do not know if that could be expressed in just a few words. Anyway, I rather do a couple of examples to find out what the pattern is. 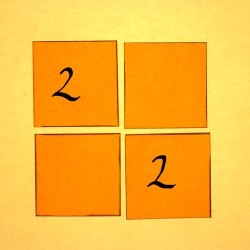 Below is a 2x2 matrix like it is used in complex multiplication. 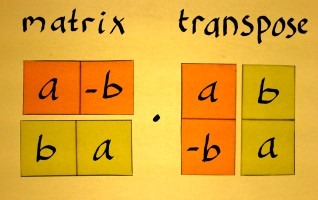 The transpose of a square matrix can be considered a mirrored version of it: mirrored over the main diagonal. That is the diagonal with the a's on it. 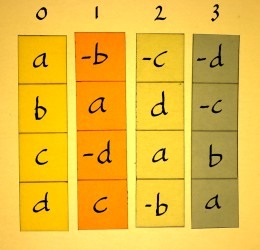 For a square matrix of any size, the same principle would hold. Just imagine that the main diagonal is a line over which the entries are flipped. The same applies to bigger matrices. Note that the middle figure is already the transpose, but it is still shown as columns. The rightmost figure accentuates the rows of the transpose. And that is how it will be used in practical applications. 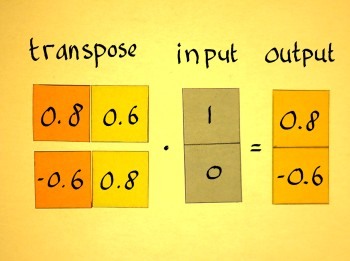 The vector-cut-and-paste-representation shows that non-square matrices have a transpose as well. 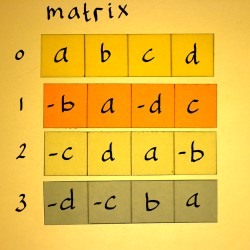 Below is a block-matrix example that may show up a few more times on my pages. 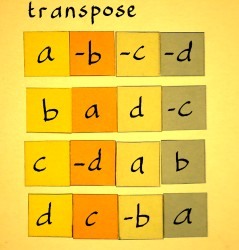 Still the question is: what is the point of a transpose, in the algebraic sense? I can only illustrate the significance of a transpose by means of the simplest examples. 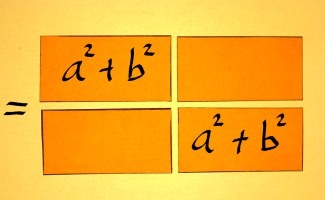 Here again, is a 2x2 matrix as it could be part of complex multiplication. 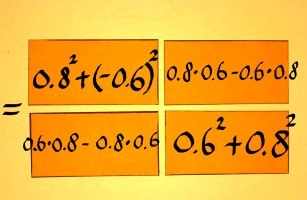 Note that such matrices already have a symmetry that arbitrary matrices do not nessecarily have. 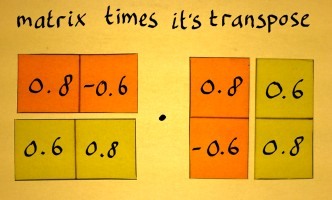 Multiplication with a 'unit puls' is done to find the responses of the matrix and it's transpose. The first matrix rotates in anti-clockwise direction, and it's transpose rotates in clock-wise direction. Such couples which are mirrored over the x-axis are called 'complex conjugates'. 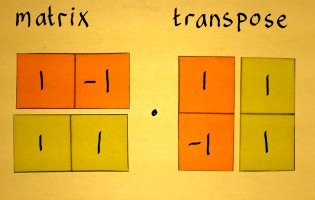 For bigger matrices than 2x2, such visualisations cannot be done. But the effect of matrix transposition in general can be considered a reversal of the rotations in it. 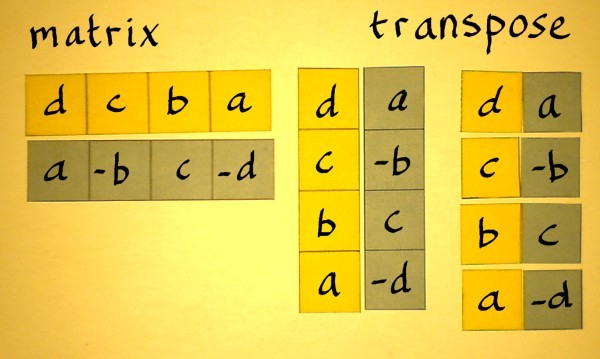 Let us now check what will happen if this matrix and it's transpose are multiplied with each other. 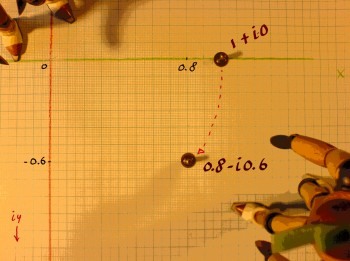 0.82+0.62 = 0.64+0.36 = 1, and (0.6*0.8)-(0.8*0.6) is zero. Therefore we have a quite special result for this case: the identity. 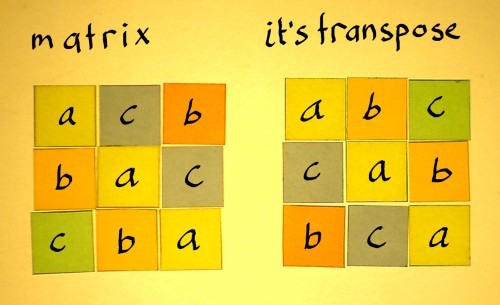 I have deliberately chosen a matrix whose transpose equals the inverse. Note that this is not regularly the case with transposes of just an arbitrary matrix. It is only the case with so-called 'orthonormal' matrices. 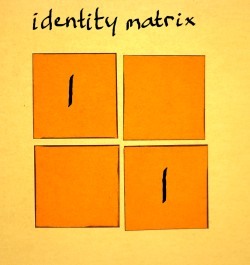 Like with real numbers, when you multiply a matrix with it's inverse the result is an identity. 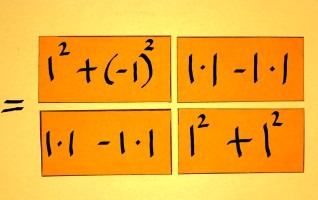 Compare with multiplicative inverses like: 1*(1/1)=1 or 4*(1/4)=1. 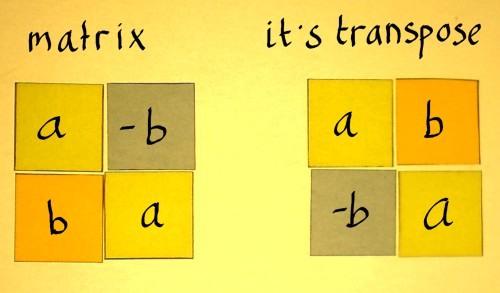 Below, is a matrix whose transpose is not the inverse. 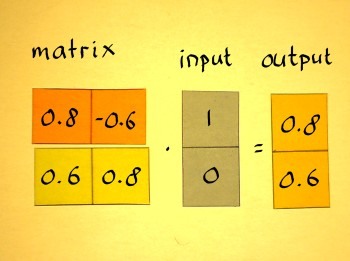 When these are multiplied the result is not an identity matrix. Still, the output shows a nice regularity. There is just another constant on the identity diagonal. All 2x2 matrices of the type that appear in complex multiplication show this constant-diagonal result when multiplied with their transpose. 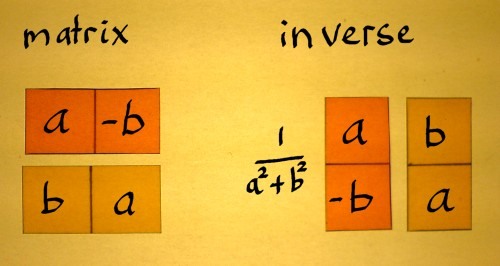 For this type of matrix there will always exist an inverse. 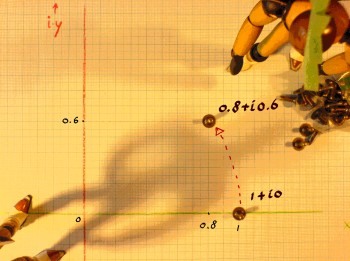 Therefore complex numbers and aggregates of these are favourites in dsp technique. They offer systematic control over data transforms, and the option to reverse a process quite accurately, if needed. And now the inverse of other and bigger matrices please? Ehhhhm.... stay in tune.